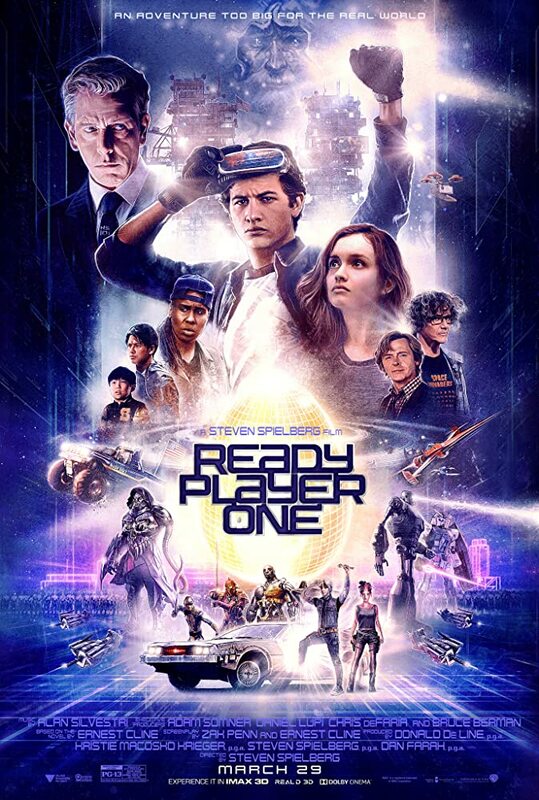 My family and I recently watched the movie “Ready Player One”. From the first 15 minutes we were hooked. It was 2 hours and 20 minutes of fast paced, realistic and computer generated genius, it had something for everyone that they could easily relate too, from my husband down to my nine year old son. It is based on a book by Ernest Cline, but I have not read it yet. I really love science fiction and fantasy and this movie really got me thinking. Could we been living in a similar environment in 2045? Could economic inequality be that bad? Would large numbers of the population really retreat to virtual reality because it’s easier and you can be anyone you want? Could a large corporation really want to take over that badly 80% of your screen, as long as you don’t stroke out?? It’s just a movie right?! The virtual technology is here all you need is a headset and the motion tracking, life-life controls. According to Pcmag.com the best VR headset can cost you from $89.99 up to $400 on Amazon. With 100’s of games and experiences for you to try and explore in your own home. I have not had the chance to try virtual reality, but I think it would be totally amazing to try. I could see how some people could get “addicted”. According to the stats 700 million people worldwide play online games by the end of 2013 expected to surpass 1.2 billion. They are actually saying 17% of the world population are gamers. According to the 2017 report there is 2.2 billion active gamers in the world. It has gone up 1 billion people in 4 years! The gaming industry is huge and is always moving up to bigger and better things. So it is safe to predict that advertising and social media will follow the same trend. As technology advances so will gaming, advertising and social media. We will all use it to our advantage. My hope is that society will not fall down this rabbit hole and be stuck in the “easy” virtual life. That they will still want to contribute to every day real life. Already our youth are on social media for self-gratification, for likes and shares, to be popular, for friends, to socialize. They have anxiety and depression problems worse then when we were kids, bullying is at an all-time high. I worry that the next generation will think that escaping reality is better then getting a job and making something of themselves. Let’s hope that we taught our children how to be responsible young adults. How to stand on their own two feet and to be strong. If there really was an “Oasis” do we really need to go there to find our self-worth in a selfish society. We are not at the “Ready Player One” stage yet. If you could life your favorite, TV show, movie, video game or book, would you want too? Facebook: A Better Reality Awaits, Get a Job! I am sure everyone has heard about Kate Spade and her recent passing. She passed recently from apparent suicide at age 55 in her own home. Kate was an iconic fashion designer best known for her sleek and modern handbags. She started the company in the 1990’s, it grew into an international brand and retail chain, which was sold in 2007 for approximately 125 million to Liz Claiborne Inc. I don’t actually own any of her bags or accessories, but I did/do covet quite a few. How could you not! Beautiful bags with clean lines, super soft leather and roomy interiors. Or maybe you want a little bling, flowers or a flamingo! All with a starting price tag of about $300. Despite reports Kate left a suicide note addressed to their daughter Bea, Spade says he has not seen it. “I have yet to see any note left behind and am appalled that a private message to my daughter has been so heartlessly shared with the media,” his statement reads, before asking for privacy for the couple’s daughter. The media response and the social media response has been overwhelming. Some of it was amazing and heart warming! I wonder if Kate knew she was so loved and respected and that she had made such an impact on so many lives. But then the details released possibly untrue? Was there a note? What did it say? Do we really need to know? NO WE DON’T. It’s a family matter. Kate Spade was an amazing, talented and smart business women. Can we not give this family some peace! This 13 year old girl lost her mother at a very influential and hormonal/emotional time in her tween life and now she has to read all the junk posted and speculated about in the news and social media about her mother. People should be a shamed of themselves! If you need help, please reach out to someone you care about. There is also many organizations there to support you. The CBC article I read had some great links if you need help, of who to contact and the warning signs to watch out for. I have listed them below. Suicidal thoughts. Substance abuse. Purposelessness. Anxiety. Feeling trapped. Hopelessness and helplessness. Withdrawal. Anger. Recklessness. Mood changes. The toll-free National Suicide Prevention Lifeline (NSPL) at 1-800-273-TALK (8255) is available 24 hours a day, 7 days a week. Social media and technology are now the new norm. They are the constant reassuring presence in our lives, in the lives of billions of people around the world, including our children. It is so normal now that we even give our toddlers our $1000 cell phones to keep them quiet when they are fussy. We hand them our tablets to play on, to watch their favorite shows on and to play Apps and games on. Our cell phones and tablets have replaced some simple things like TV, colouring books, and flash cards. Sometimes parents even have separate cellphones and tablets just for the children. And then as we get older, tweens, teens and young adults cell phones, tablets and social media is normal. It is what they have always known and all their friends are using it. But is anyone watching them or checking up on them? We are creating a dependence on technology at a young age for soothing and distraction instead of playtime. Instead of a baby or toddler learning to entertain themselves and use their imagination. Even I am guilty of this. Now my children are almost tween’s and I am having to correct my own mistakes. My children grew up having lots of social interaction and played house league sports but I also handed them my cellphone when I needed 5 minutes of quiet. Now this scary word comes along. SOCIAL ANXIETY. Say What?! Tween’s dealing with Social Anxiety. It has all seemed to get worse in grade 7 and 8th year of public school when all the girls are blowing up each other’s cell phones, snapping and chatting and whatever it is they do texting away together. All the stress, anxiety and tears. The depression. The hormones. According to the New York Times article Why are More American Teenagers then Ever Suffering From Severe Anxiety?, Parents, therapists and schools are struggling to figure out whether helping anxious teenagers means protecting them or pushing them to face their fears. Anxiety is the most common mental-health disorder in the United States, affecting nearly one-third of both adolescents and adults, according to the National Institute of Mental Health. After a problem of bullying we had in the fall last year on social media in a group chat my daughters no longer have social media, as in Facebook or Snapchat. They are still allowed to use YouTube and play games online. My one tween daughter could careless, she’s sporty and it doesn’t bother her. My other daughter, well she was the social one and the one that was bullied. Tween girls are mean and catty and when you get a bunch of them together in a chat, things can get crazy! Especially if boys are involved. I spoke to the parents of the kids involved, one said she would speak to her daughter and she understand mental health because she suffered as a teenager, but I never did hear back from her. The rest didn’t seem to care. I asked them to read their kids chats and check their Facebook, and see what was going on and being said. Kids will be kids, I was told. I think they thought my husband and I were over reacting. Believe me, we were not. This past weekend was beautiful, the sun was shining and when I got up Sunday morning my son was already on his tablet, and he was the first one up of course. “One-hour buddy and you are done for the day” I tell him and I think to myself, this is not happening today. He is going outside and he’s going to like it! He can be a boy and play and enjoy the sunshine, ride his bike and get dirty! He’s 9 by the way. So, what happens when the hours up you wonder? HA HA that’s hilarious right! Well there is always some resistance, but I stick to my guns! “Time to go play outside, there is another boy riding a scooter playing in the court, why don’t you go outside and play with him and make friends, he looks familiar” I suggest. “But mom” …you have to wonder why kids find it so hard to make friends. I sigh. “Just do it” I say. See I am such a mean mom. So we go outside together, I totally got this. My son is going outside to play and that’s final! I exchange good mornings with the neighbours and their friends who are enjoying the mid-morning sun. I tell them Boy 1 (my son) would like to play with Boy 2 and ride scooters around the court. And the neighbour who has visitors is like that would be amazing, boy 2 would like that wouldn’t you boy 2?” Boy 2 just looks at us from across the court. Wow kids can be friendly. Can you imagine the frown? Because it was big. HI boy 2, this is boy1, boy1 loves riding scooters, playing basketball, building worlds on Minecraft and playing Roblox’s on the computer. Boy 2 is like, I like the same things! Oh My Goodness, Can you believe it! Success! I silently jump for joy. Does life really have to be so hard? They like the same things, who would have thought! By the way my daughters hate it when I do this. I told them when they learn to do it for themselves I won’t have to do it anymore. They are 13. But Mom’s are supposed to be embarrassing right? Is that so hard? Maybe I should teach a class on introductions for kids? What do you think? Are we making life to hard for our kids? Is social media replacing the basic concept of making friends in real life interactions? Facebook: Life of an Interfering Mama of Tween’s, How to Make Friends 101: Say HI! Twitter: How to Make Friends 101: In one easy step! Say HI! Don’t let your Mom do it for you!